Taste test: This bag contained a lot of crisp, large, roundish, unbroken chips with a sweet barbecue taste. They were pretty good, and the bag got emptied by the citizens of the chip bowl pretty quickly, but but the chips were short of outstanding. Some were pretty good, with a nice sweet taste, but others were a bit too sugary, and still others had very little barbecue seasoning on them. Smell test: Good sweet barbecue smell with a bit of a kick to it. 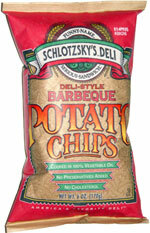 Company: Schlotzsky's Brand Products L.P.